Francisco Toledo exhibits a series of about 40 self-portraits. 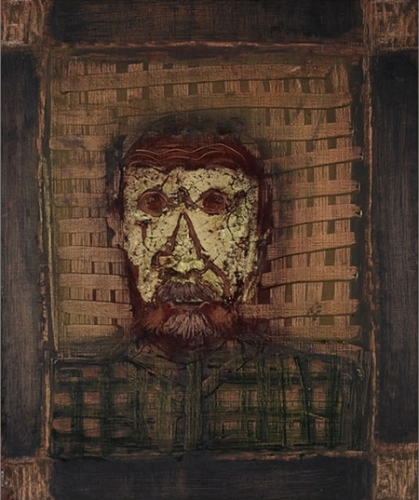 He is regarded as one of the finest living artists in Mexico, and enjoys an international reputation within the art world, if not so much beyond it. Perhaps a show made up entirely of the artist’s visage will help to remedy that detail. He received the ‘Right Livelihood Award’ or ‘Alternative Nobel Prize’ in December 2005. Travel guides mention him when they write about his hometown in southern Mexico, Juchitán de Zaragoza in the state of Oaxaca. Of course greater public visibility is hardly the motivating force behind the show or for Toledo, who The Guardian’s Christopher Goodwin says, “... courts anonymity, not celebrity.” The 77-year old artist is not only remarkably skilled in diverse media, including graphics, sculpture, painting, drawing and photography, but he is also a philanthropist, humanitarian, social activist and overall true inspiration. Born to a poor Zapotec family in Juchitan, Oaxaca, Toledo grew up in Minatitlan, Veracruz and later lived in Mexico City, Paris, Barcelona, New York and Santa Monica, traveling back and forth between the Americas and Europe. In Paris during the 1960s, he worked with English printmaker Stanley William Hayter and rubbed shoulders with Nobel Prize-winning writer Octavio Paz and Olga and Rufino Tamayo, who supported his career, which is international in its scope. But what’s so impressive about Toledo is what he's done after achieving success. He founded the Instituto de Artes Gráficos de Oaxaca (IAGO) in 1988, which has a collection of 9000 graphics (ranging from Albrecht Dürer to Pablo Picasso to Otto Dix), a library with over 30,000 art books, and a sound archive with classical, jazz and rock music. In 1993, he began the citizens’ initiative Pro-Oax, which prevented the opening of a McDonald restaurant in the old city of Oaxaca and the building of a Wal-Mart-Supermarket behind the famous Teotihuacan Pyramids, near Mexico City. He also launched the Centro Fotográfico Álvarez Bravo, the Cinema el Pochote, which offers international film classics, the Patronato Pro-Defensa y Conservación del Patrimonio Cultural de Oaxaca, a library for the blind. He is president of Museo de Arte Contemporaneo de Oaxaca (MACO). The self portraits that comprise this exhibition go beyond biography to take a profound and honest look at the man. “My Birth,” painted in brown and beige hues with silver and gold leaf, displays Toledo as he comes into the world. Instead of presenting himself as a newborn, however, he appears matured, suggesting his spiritual birth as an artist and the social-humanitarian purpose he was born to serve. An untitled self-portrait (2017) executed in muted colors, presents him in a dark-blue shirt with a golden pattern, deep forehead wrinkles, and disheveled hair, sitting at a desk reflecting and gazing at a self-portrait within the painting. He appears to wonder why he’s painting himself or what he wants to reveal on canvas. In “The Iguana that Accompanies Me” the lizard is perched on the artist's shoulder, referencing his previous works of anthropomorphized animals. Although he appears rather somber here, the painting is in fact quite humorous. It turns the idiom that he has a chip on his shoulder into an iguana, a symbolic spirit guide. “Eye of the Beholder” a painting of earthy and blue tones with a surrealistic undertone, depicts Toledo’s face with closed eyes surrounded by variously shaped eyes, some portrayed individually at others in pairs. It’s an apt metaphor of the magic of aesthetic seeing.